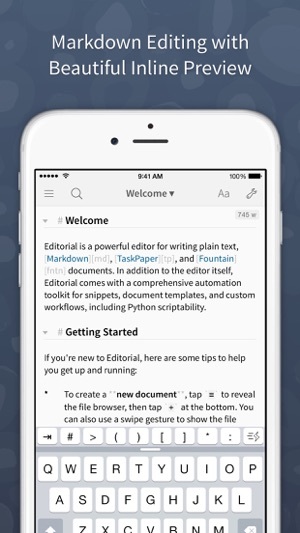 Editorial is a plain text editor for iOS with powerful automation tools and a beautiful inline preview for Markdown, TaskPaper, and Fountain documents. * Inline Markdown/Fountain Preview – With Editorial's subtle syntax highlighting, you can see your document's formatting immediately while you're writing. And when you need a full HTML preview, it's just a swipe away. * Extensible with Workflows and Scripts – Select from over 50 text processing actions to create your own workflows for extending Editorial's feature set. 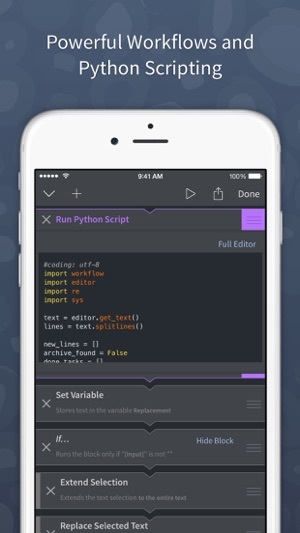 For even more advanced automation, you can write Python scripts with an integrated code and UI editor. * Dropbox Sync – The sync folder is customizable, so you can easily edit your documents with multiple apps. * Smart Keyboard – The extended keyboard was specifically designed for writing Markdown and includes all the special characters you need. 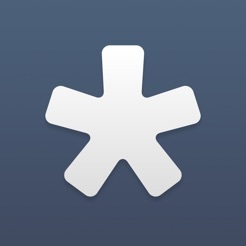 You can also control the cursor with simple swipe gestures. 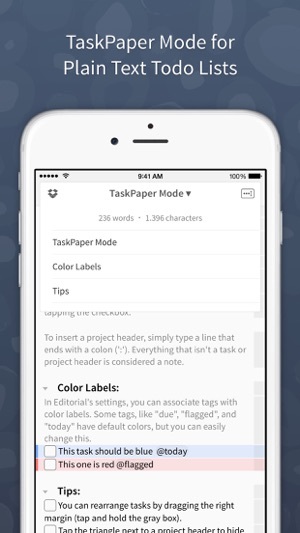 * Snippets – Quickly insert frequently-used pieces of text by typing abbreviations. Snippets can include dynamic text, e.g. the current date or clipboard contents. TextExpander™ snippets are also supported. 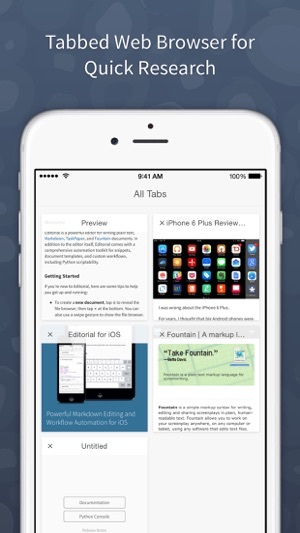 * In-App Browser – If you need to do some quick research while writing, you don't have to leave the app for that. You can even open multiple tabs. * "Folding" allows you to quickly hide individual sections of your document while you're writing. 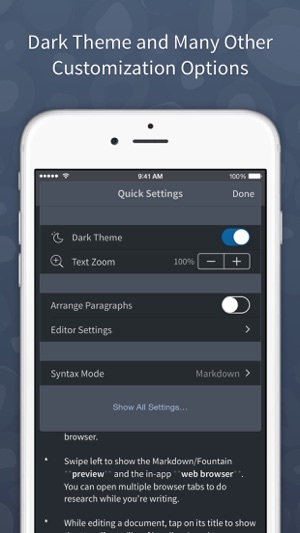 Bugfixes for Dropbox sync and workflows with custom UI. I use it primarily for note taking in meetings, at conferences, etc and it works amazingly for my workflow. I do agree that the app is ready for some updates, however in my opinion it was 6 years ahead of it's time when it was released. Ole Zorn is a forward-thinking genius and Apple is just beginning to even become close to catching up from the OS side by acquiring Workflow and launching Siri Shortcuts. At this point, the app is still ahead of it's time in some areas, but just barely beginning to fall behind in other areas. It's important to keep in mind that Editorial is primarily geared toward power users with at least a little bit of programming knowledge, the extremely negative reviews are coming from users who were in way over their head when they installed it. If you have a little bit of curiosity, hunger to learn, ans commitment to improving the way you write or take notes, Editorial is for you. Spent over a hour with this buggy and largely unusable text editor. Impossible to get back to file menu once doc is complete; top row of keys appears and disappears; slide finger to move cursor does not work unless top row is absent and no evident way to make that happen consistently. You can begin new doc at first but then next to impossible to start another doc or return to menu. Only thing that functions as it should is the share sheet. Sure the cost is cheap but you get what you pay for and in this case you get next to nothing. 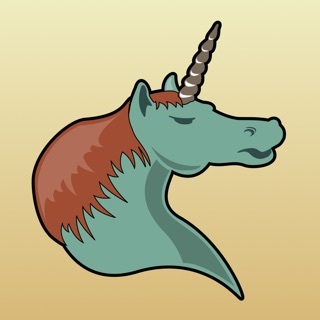 The positive reviewers for this app must either be shills or living in a fantasy world. The developer is MIA. It *was* the best plain text editor with Markdown and Dropbox support, but, given that the developer barely updates it once a year and doesn't reply to direct/private messages on Twitter asking when it will be updated to support the iPhone X, I think it's safe to say that the app has been abandoned at this point. I'd be happy to change this review if the developer updates the app once in a while, but I've moved on to another app. I don't love it as much as I loved Editorial, but I'd rather support another developer who is still improving his app than try to work with software that isn't getting the attention it needs.